Performers include: Miley Cyrus, Emily Osment, Jason Earles, Billy Ray Cyrus, Mitchel Musso, Moises Arias, Anna Maria Perez de Tagle, Shanica Knowles, Romi Dames, Cody Linley, Frances Callier, and Greg Baker. Miley Stewart (Miley Cyrus) leads a double life. By day, she’s a normal high school girl and by night, she’s a pop singer known as “Hannah Montana.” She goes through a lot to keep her identities secret and only her best friends and family know the truth. Following the death of her mother, Miley and her father and brother moved to California from Tennessee. Robby Ray Stewart (Miley Cyrus’ real life father, Billy Ray Cyrus) is Miley’s father and leads a little bit of a double life himself, serving as Hannah’s manager. Prior to his wife’s death, he was a successful singer himself and went by the name Robbie Ray. Miley’s older brother, Jackson (Jason Earles), was teased when they first moved to California because of his accent and country attire (including a large belt buckle). He works at Rico’s Surf Shop and is always trying new money-making schemes, including selling his sister’s belongings as Hannah Montana souvenirs. 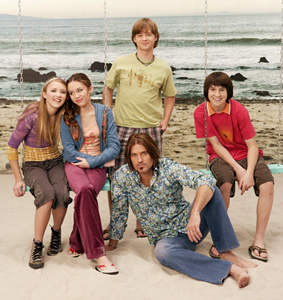 Miley has two best friends, Oliver Oken (Mitchel Musso) and Lilly Truscott (Emily Osment). Oliver lives with his parents and a little brother. He’s the second one to learn Miley’s secret and also had a bit of a crush on Hannah. Rico (Moises Arias) is the young manager of Rico’s Surf Shop, a beach concession stand, and Jackson is his sole employee. He goes to school with Miley, Lilly, and Oliver, after having skipping a few grades. He comes from a wealthy Latino family and is the only major character to not know Miley’s secret, but he’s come close to learning the truth many times. when does the finale air??? @your mom: They haven’t announced it yet. But there’s a whole season to come.